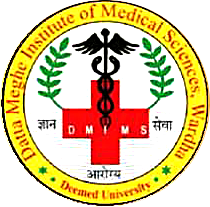 Datta Meghe Institute of Medical Sciences (Deemed to be University) was granted the status of Deemed to be University by University Grants Commission, on 24th May, 2005. The university has been consistently reaccredited with the ‘Grade A’ by NAAC in 2007, 2013 and 'A+’ in 2017. The university has been placed in ‘Category-I Deemed to be University’ as per University Grants Commission (Categorisation of Universities only) for grant of graded autonomy, regulations 2018. The University has also received the prestigious Dr. B.C. Roy Award for Institutional Research. The constituent Units of Deemed University are located in a 125 acres campus in Sawangi (Meghe), Wardha about 80 kms from Nagpur, Maharashtra, India, which is the geographic centre of India. It is located away from the hustle and bustle of the city amidst serene surroundings in a self-sustaining complex with an excellent academic ambience. To provide for need based, learner, community and quality centric education in all such branches of learning as may be deemed appropriate from time to time, so as to enable a student to reap the fruits of tertiary education. To create higher intellectual capacities and abilities towards generation of Globally relevant trained health manpower. To venture into innovations and evidence based modifications in various domains of educational process as a whole. To provide for generation of new knowledge through interdisciplinary research relevant to the societal needs. Mahatma Gandhi Ayurved College Hospital and Research centre, Salod (H), Wardha is established in 2007 under the ambit of DMIMS (DU). It is the first college in India with NAAC ‘A+’ and NABH accreditation. Central Council of Indian Medicine (CCIM) has recognized the institute as Regional Centre for training & Academic activities. This college runs UG course, PG course in 9 specialties with 44 seats along with Ph.D., M. Phil. and fellowship courses. 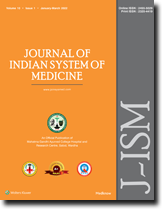 J-ISM (Journal of Indian System of Medicine) is an Official publication of Mahatma Gandhi Ayurved Medical College, Hospital & Research Centre, Constituent unit of Datta Meghe Institute of Medical Sciences (Deemed to be University). The journal is being published from 2013 and has constantly contributed in producing evidence based research works and propagating various traditional Indian system of medicines. The journal accepts papers from the field of Ayurveda, Yoga, Naturopathy and Siddha medicine. The journal will cover technical and clinical studies related to health, ethical and social issues in field of Ayurveda and other Indian System of Medicines. Articles with clinical interest and implications will be given preference. Journal of Indian System of Medicine, a publication of Official publication of Mahatma Gandhi Ayurved Medical College, Hospital & Research Centre, constituent unit of Datta Meghe Institute of Medical Sciences, is a peer-reviewed print + online Quarterly journal. Online since 3rd April 2019.